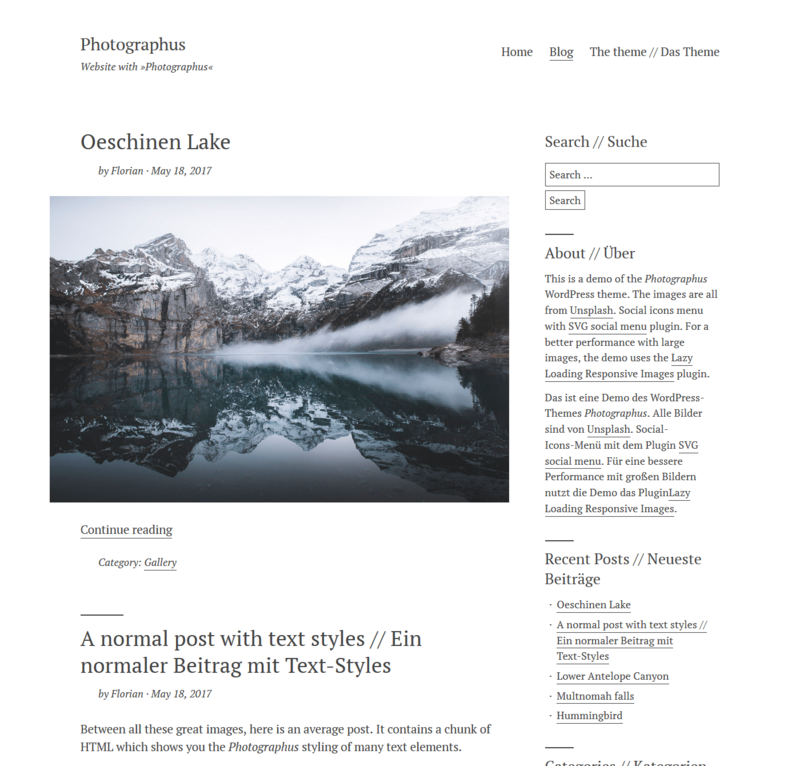 Photographus is meant for photo bloggers and photographers. It gives your images much space — they can go beyond the content area and be as wide as the browser window allows it. 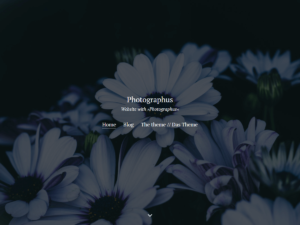 The theme comes with front page panels, which allow you to show, for example, a grid of your latest posts with featured images, a list of your latest posts, and the content of a specific post. 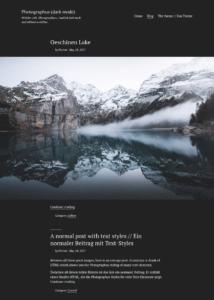 Besides that, you can enable a dark mode and make use of the post type templates, which let you, among other things, display a featured image beside the content. Support: Questions before or after the purchase? Write me an email! You can find the theme on GitHub. 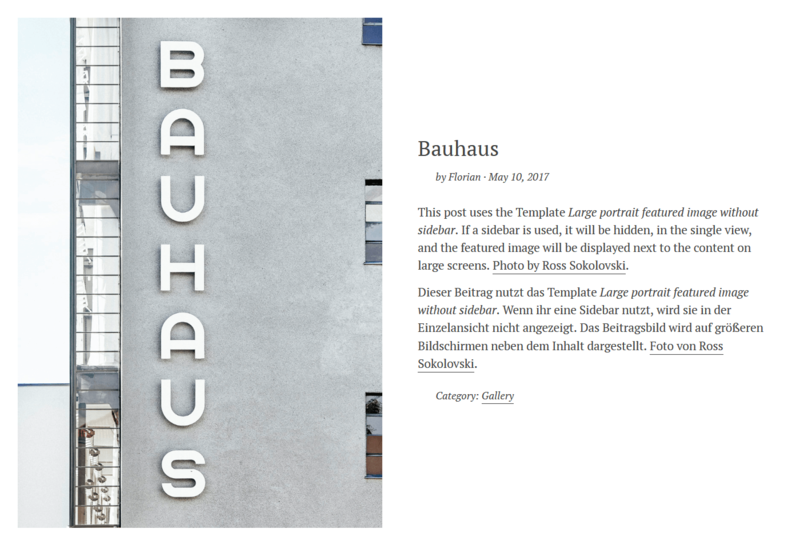 Feel free to give it a try – you can find an installable photographus.zip on the releases page. 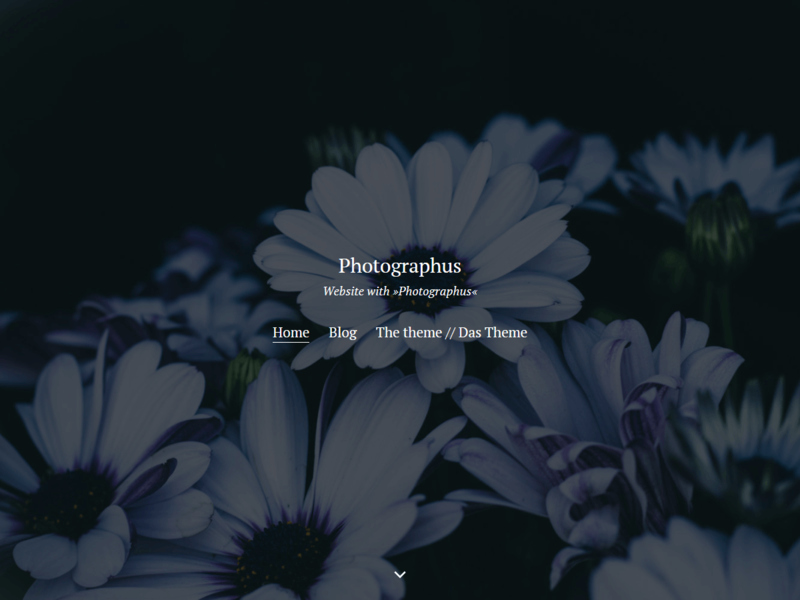 If you like it and want to use it for a website, I would be thrilled if you would buy it – thanks ❤ (besides my eternal thanks you will get support if you have problems with the theme and the ability to use the automatic updates feature for one year 🙂 ). If you use a child theme, you can track parent theme changes with the »Child Theme Check« plugin. The theme is translation ready and currently available in English and German (informal). If you want to translate it into another language, just write me an email. The max width of the content area is 751 pixels. But you can let the images go beyond the content area, so maybe they should be larger. However, you should keep the file size as small as possible and maybe use a lazy loading plugin. 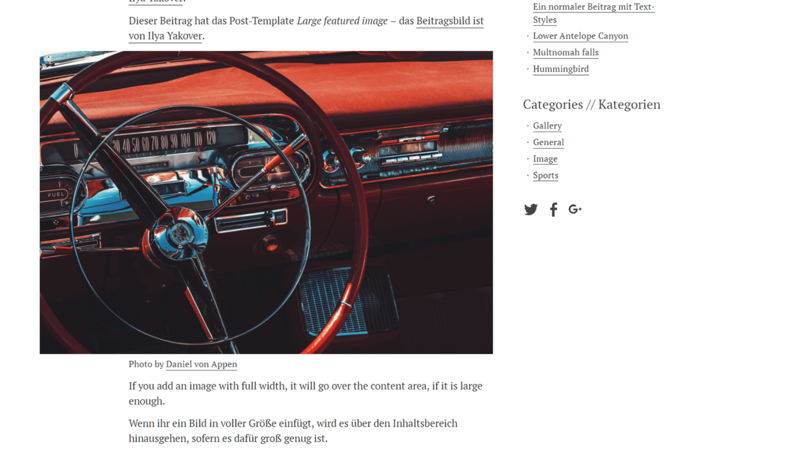 The same goes for featured images — for that, you need to choose one of the specific post type templates (see the next section). Large featured image — the featured image is displayed larger than the content area if the viewport size allows it. Large featured image without sidebar — the same as above, but hides the sidebar. 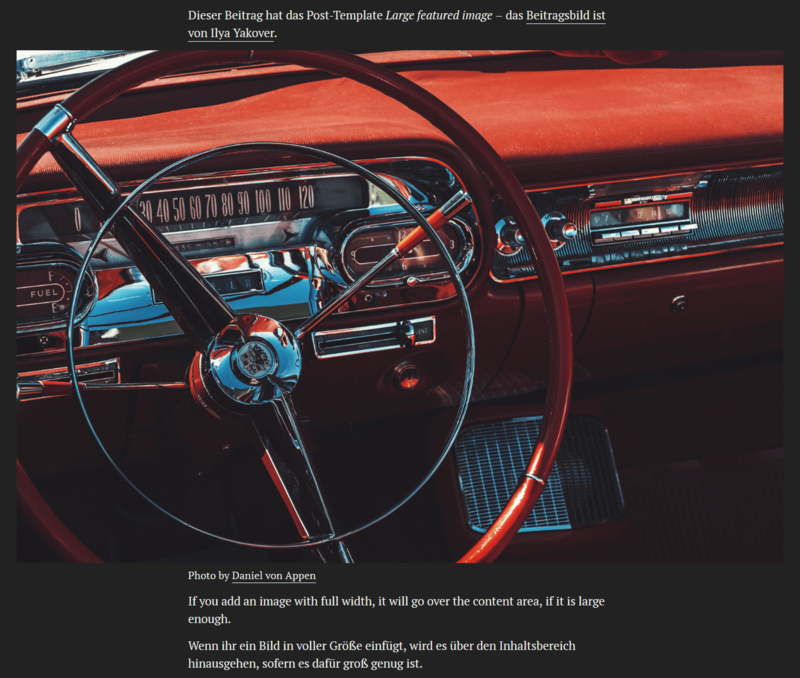 Large portrait featured image — displays the featured image beside the content on larger viewports (if you use no sidebar). Large portrait featured image without sidebar — same as above but hides the sidebar. You may ask: Why is there a portrait template variation with a sidebar if the difference to the Large featured image template is only visible without a sidebar? The answer: Maybe you want to have this look only on the front page with panels (never has a sidebar), but with a sidebar in the single view. No sidebar — just a template without a sidebar. The front page panel feature allows you to show different content types in multiple sections on the front page. To use that feature, go to Appearance › Customize › Theme options after setting a static front page. Important: The panel option in the customizer is only visible if you are previewing the static front page. Display a grid of posts which has a post thumbnail. You can define the number of posts, hide the post titles, only show posts with the post formats Gallery or Image, and select a category. Display the latest posts from your site. 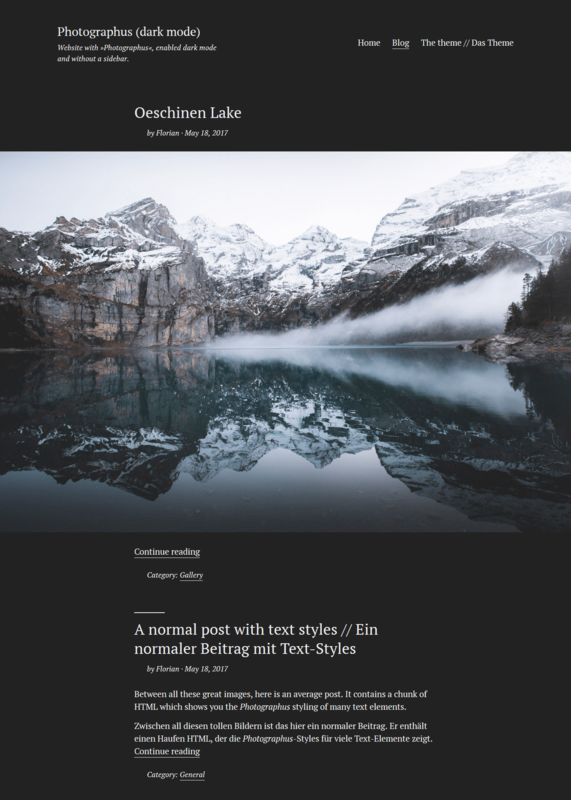 You can define the number of posts to show and optionally show a short version, where only the header meta is displayed. Display the content of a page. Display the content of a post. Additionally, you can hide the content of the page which is set as the static front page. The header image is displayed as the header background image on the front page if you use front page panels. The theme comes with a Dark mode that lets you enable a dark background color and light font color (you can find the option in the customizer). You should not use that if you use the theme for a text-heavy site because a longer text in light color is harder to read on a dark background than dark font on a light background. You can enable an alternative header layout in the theme options in the customizer, which displays the header menu below the centered website title — also on large viewports. The theme comes with two menu locations: one in the website’s header, one in the footer. It also brings two areas for widgets: one in the sidebar and one in the footer above the menu location. Questions, suggestions or critique? Just leave a comment!